CAD2Shape converts AutoCAD® DXF or DWG formats to ESRI Shapefiles (ArcGIS®, ArcMap, ArcView etc.). Completely stand alone (does not require AutoCAD®, ArcGIS®, ArcMap). All our software come with permanent license (one-time payment), 1-year free upgrade and 1-year free technical support! • Select output Shapefile types, such as MultiPatch, 2D/3D Polygon, Polyline, Point, Text Labels. • Support All AutoCAD DWG / DXF versions including AutoCAD 2020. • Batch Conversion and export CAD layer to Shapefile. • Additional projections such as Gauss-Kruger, SIRGAS 2000. For bidirectional conversion between Shapefiles and DWG / DXF, purchase CAD2Shape & Arcv2CAD bundle and receive 25% discount! Step 1: Select a DWG file(or DXF file). Step 2: Select Shapefile Output Type (Point, Polyline, Polygon, MultiPatch, 3D). In this demo, Polyline is selected. Then press Attribute Button. Step 3: Select Attributes that you want to convert. Press OK button. Step 4: Press Save button. Then CAD2Shape converts the DWG / DXF file to a shapefile. CAD2Shape converts AutoCAD® DXF or DWG formats to ESRI Shapefiles (ArcGIS®, ArcMap, ArcView etc.). The software is completely stand alone (does not require ArcGIS®, ArcMap, ArcView). The software lets the you tailor the conversion to suit your needs. CAD2Shape is a perfect DXF to shapefile converter software. Converting CAD to GIS tutorials are available for CAD2Shape users. With CAD2Shape, you do not need to convert dwg to shp by using QGIS or export shapefile from AutoCAD Civil 3D anymore. 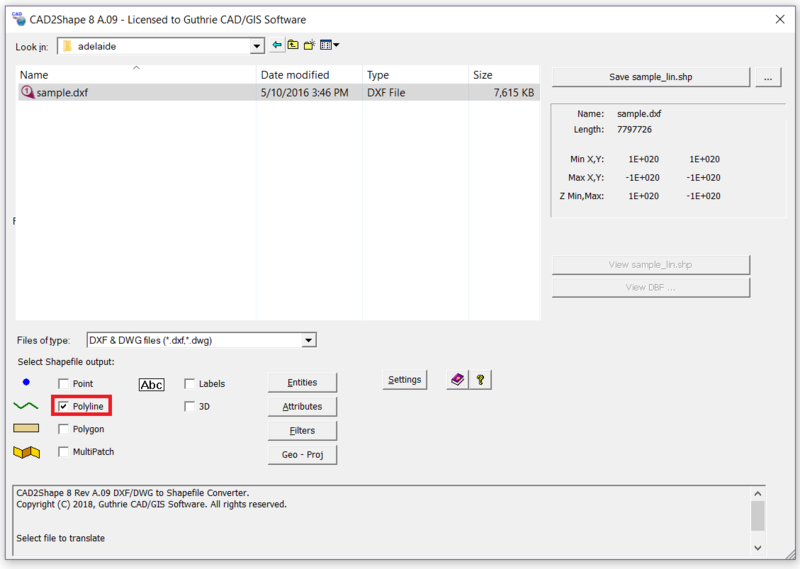 • Stand-alone CAD to Shapefile conversion. • Translates all AutoCAD DXF and DWG versions including AutoCAD 2020. • Optional translation to 2D or 3D shapefiles, or a 2D shapefile with the Z value attached as 'Elevation' data. • Text to 'Labels Theme' conversion. • Create Feature Attributes from ATTRIB data. • Translate 3D surfaces to MultiPatch shapefile types. • Translate to all 2D/3D shapefile types. • Filter by Layer, Area, Color, Entity. • Batch conversions using command line mode. • Translation to XYZ data files. You can customise Shapefile output by using many built-in conversion features that other converter software does not support! (For example: in the screenshot image, polyline and "CAD Entities to translate" are selected in purple rectangle). You can easily keep AutoCAD Annotation objects when converting DXF/DWG to ESRI ArcGIS Shapefile. 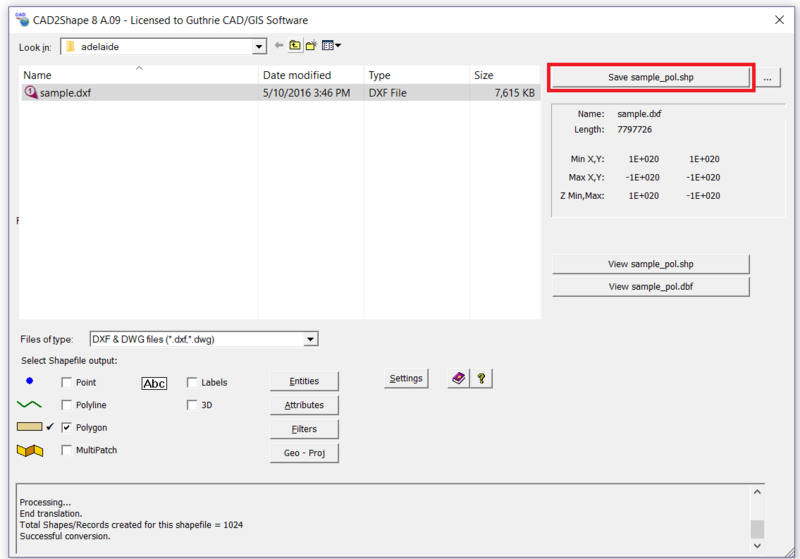 You can also change to convert AutoCAD file to XYZ data format on CAD2Shape. "Both the CAD2Shape and Arcv2CAD applications have been the very best, simple and most reliable Arc to CAD conversion apps I’ve ever encountered and have been trusted friends for many years." "I find the CAD2Shape infinitely more efficient and useful than AutoCAD Map (and less expensive)." "Much appreciated. 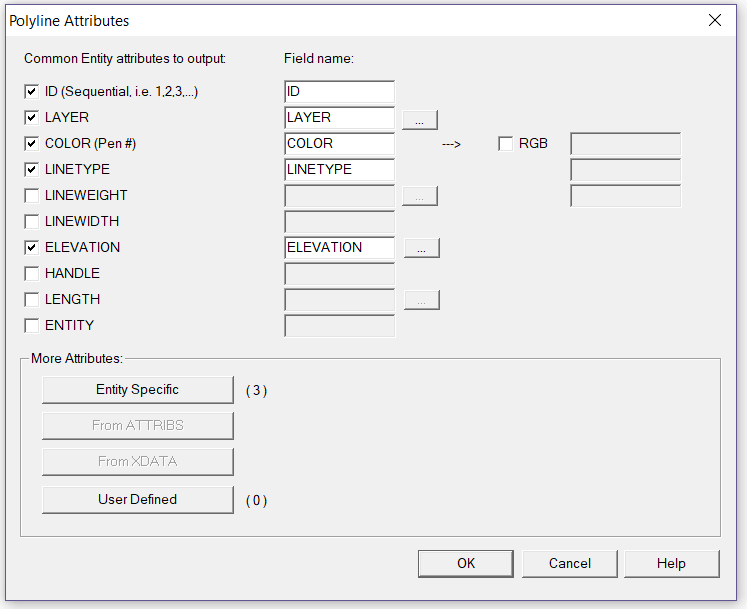 A big part of the allure of the CAD2Shape is that the user defined attributes table is configurable, making a template usable across all survey and engineering firms." "CAD2Shape works perfectly. Thank you again for a great product!" "Always really liked the CAD2Shape software. And the fact that you work with your customers this way is really impressive." "Thanks for a superb product! It is a pleasure to use the CAD2Shape on an everyday basis." • Extended Entity Data (Xdata) translation. • Translation to 2D shapefiles(Point, Polyline, Polygon and Multipoint). • Translation to 3D shapefiles(PointZ, PolylineZ, PolygonZ, MultipointZ and Multipatch). • Keep AutoCAD Annotation objects when converting DXF/DWG to ESRI ArcGIS Shapefile (Attributes translation). • Text to 'Labels Theme'. • Text to exploded polyline option. - allows direct translation of CAD Text to visible text in ArcGIS/ArcMap/ArcView. The resultant text and placement will be visually identical to that in the originating CAD drawing. • Create feature attributes from ATTRIB data, Xdata, Entities properties and User defined attributes. • Attach Z value as 'Elevation' data. • Batch conversion via command line. • Layers control - translate only the CAD Layers that you require. • Region control - translate the whole drawing or a selected area. • Translate AutoCAD entities (point, line, polyline, circle, Arc, Hatch, 3D face, 3D mesh etc.). • Length attribute for polylines. • Suport coordinate system (Lat/long degrees, UTM WGS83/NAD84, Gauss-Kruger and SIRGAS 2000). • Optionally output to Excel/CSV, XYZ file. 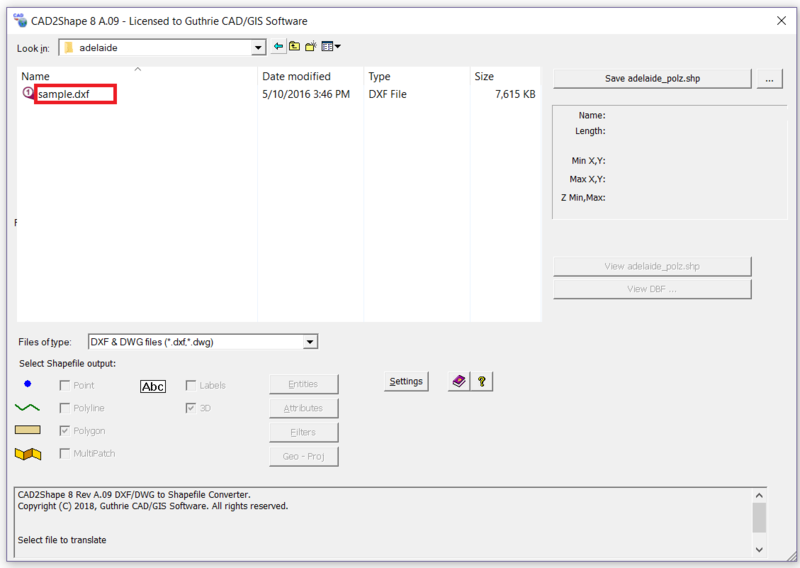 The evaluation version of CAD2Shape is enabled for 15 days and for 20 large file translations (up to 10 MB). After the 15 day trial is up the software will still continue to work, but only for small test drawings (<100K). Buy a standard license. Prices start from $149 USD. You can see details of the price structure from here. Buy a network license. Prices start from $450 USD. You can see details of the price structure from here.